LuxCraft Poly Outdoor Furniture is the perfect choice for quality outdoor furniture in a fantastic range of colors. Make your garden or patio an extension of your home with products which are hand crafted and boast two incredible features: they are Eco friendly to minimize damage to the environment, and they are absolutely maintenance free. 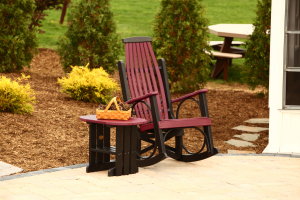 These Amish Made Poly Lawn Chair Accessories are made from a material which is derived from recycled water bottles and milk containers, and the finished product contains more than 90% recycled material. So when using your new deck accessories, you can be safe in the knowledge that you are helping to protect the environment. The Polyethylene material of this type of furniture will not splinter or crack, nor will it rot or grow mildew in damp conditions and it won’t attract termites. So there will be no need to paint or stain it at the start of each season. If the summer is hot, LuxCraft Poly Furniture will not warp or fade in the sun because it is UV Stabilized: a Lifetime guarantee is offered for your peace of mind. You can rest assured that LuxCraft Poly Furniture is environmentally friendly and involves no work on your part to maintain it. Sit back, put your feet up and soak in the sun! More than 15 color combinations are available from zesty yellow to Aruba blue or more traditional colors such as chestnut brown and black. Whatever color combination you prefer, you can be sure to find something suitable from our matching Poly Furniture line. Add a stylish finish to your outside area with quality, Eco friendly construction furniture which is easy to clean and totally maintenance free. 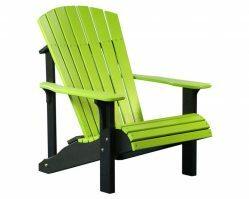 Deluxe Adirondack Chairs are designed for superior comfort and durability, plus there’re made of poly material, which is virtually maintenance- free. All you need to do is select your color, sit back, and relax. These beautiful waterproof, fade resistant, Adirondack chairs will never become scratched or split, and are backed by a lifetime manufacturer’s warranty. Poly patio furniture does NOT absorb water and dries within minutes. Available in natural wood finishes or any bright color combination of your choice! Choose a color combination from the drop down on the right to see what we have in stock. Call us for color combinations not seen on our website.